In the Nordic countries it is of vital importance to be able to generate heat in an economic and hygienic way as the climate is so severe that a mere bonfire in the middle of the house or even a fire place cannot keep you warm and comfortable. The revolution in the development of stoves took place in the 18th century in Sweden. It had become apparent that the forests were getting thin in the vicinity of habitation and industry and that wasting the fuel in ineffective stoves had to be stopped. The kind of tiled stove that is still in use in the countries around the Baltic Sea is said to have its origin in the Alps. In 1767, Carl Johan Cronstedt, an architect, and Fabian Wrede, a field marshal, published their solution to the alarming problem of diminishing forests: a very efficient and economic heating apparatus, the tiled stove. The revolutionary idea was to store the heat from the fire into the mass of the brickwork in the stove by leading the smoke up and down through long vertical channels before letting it out through the chimney. In addition, the opening of the furnace was made smaller than it is in a traditional fireplace. The opening was also provided with shutters to regulate oxygen take and consequently the speed of the burning process. Furthermore, the chimney is closed by a damper to avoid heat loss after the fire is burnt down. Already in the very first drawings by Cronstedt and Wrede even the need for ventilation was solved by adding an air duct into the system of channels of one of the models they presented. Tiled stoves (Sustainable Heritage report No. 3) was the topic of the 2011 intensive course which was held in Ekenäs, Finland. Learned lecturers from Sweden and Estonian described the traditions in their countries while the hands–on work was carried out in a historic school building. Two very big tiled stoves were re–erected and partly reconstructed. They stand in an old classroom of a 19th century school building which had no other heating than two stoves per classroom until 1962. 15 stoves remain from those times—13 of which are out of order because the smoke channels are worn out and partly blocked… more documentation, program and images on Hands–On Work in September 2011. Hands–on work part 1 in April 2011: In the first part of this intensive course, a group of students from Novia UAS, the host school, dismantled three tiled stoves that were not in working order. Two of these will be built up in the autumn. The picture series shows the dismantling of stove 1 which was replaced by a better one from a minor room. 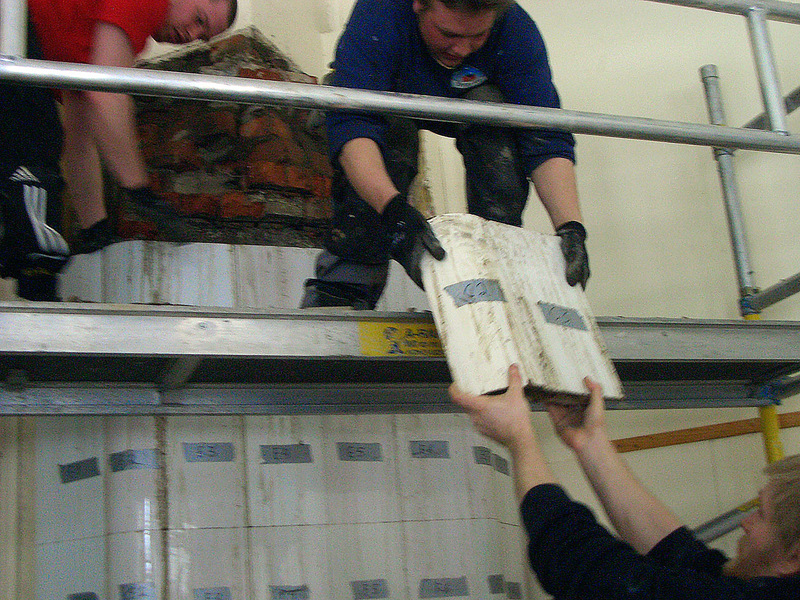 Hands–on work part 2 in September 2011: Re–erection and partly reconstructing of two dismantled tiled stoves in a historic school building from the 19th century… more documentation, program and images on Hands–On Work in Autumn 2011.